The bracelet consists of 7-8mm AAAA GEM quality freshwater pearls with "Very Highr" luster, our highest grade available in every category. The brilliant lavender/pink color of this bracelet would also go great with one of our exquisite lavender/pink freshwater necklaces. The pearl bracelet is affixed with a beautiful 14K white gold clasp. 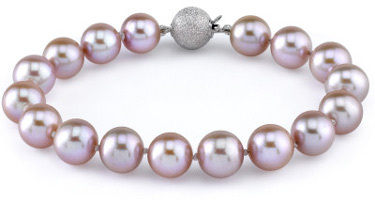 We guarantee our 7-8mm Lavender Freshwater Pearl Bracelet - AAAA Quality to be high quality, authentic jewelry, as described above.